If you like to sit in the back and let somebody else do the driving you’re looking for a car that will help you travel in comfort. And if you are on the look out for a sedan with a budget of Rs 7-10 lakh it not easy to decide which car should you buy? We help you decide! There are quite a few good cars to choose from: From the always-there Honda City, to the Vento that promises all the benefits of German engineering, to the recently launched Skoda Rapid, Nissan Sunny, Hyundai Fluidic Verna and the Ford Fiesta. In fact you also have the reliable Maruti Suzuki SX4 and the gorgeous Italian Fiat Linea. But that does not make it any easier for you. 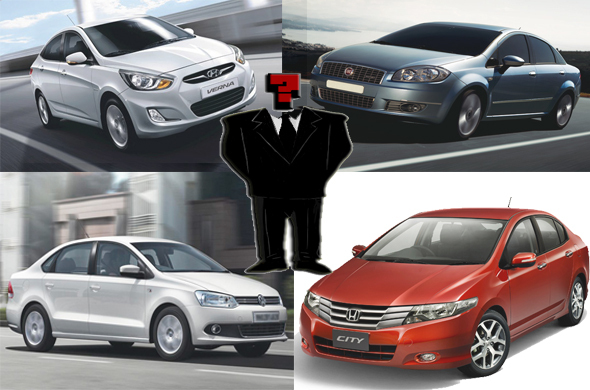 So, which is the best chauffeur-driven mid-size sedan available in the market? Here’s how you could think about it. The one thing that would matter most if you are being driven around is comfort. Space particularly in back seat is important. You want good leg and head room. Seat height and cushioning under thigh (they call it lumbar support) too is important as is the back incline which shouldn’t be too straight. Ride quality plays an important role in deciding whether the car is truly comfortable. You don’t want the car to pass on the shocks from the bumps or let too much noise enter the cabin. Other features like climate control and rear AC vents too go a long way towards making back-seat passengers comfortable. We have assumed that since you can afford a chauffer in addition to the car, you have had a fair amount of success in whatever you are doing. So the car should have the LOOKS. Appearance: Have people taken to the way the car looks. You want heads turning when you pass by! Fit and Finish: Often, the quality of paint job, the tight shut lines on doors etc go a long way towards creating premium image for the car. They add to the looks. Interiors: You definitely want to be surrounded by high-grade plastics and preferably leather upholstery. There are other things that would matter for sure. But these two are far more important if you are a “classical chauffer driven type”. Now that we have outlined the factors, let’s see how different cars on the market stack up against these. For all its troubles it’s hard to keep Fiat Linea (T-Jet and T-Jet Plus) out since it scores heavily on the comfort. It’s easily the biggest car in the group—actually it is as big as Toyota Corolla Altis and Honda Civic. It has a huge boot. It rides rather well absorbing bumps better than most comparable cars. Nissan Sunny, with its phenomenal interior space will appeal to buyers for sure. In fact, the rear-seat legroom of over 636-mm allows you to sit with your legs comfortable stretched even if the front seat is pushed back fully. Then there is Volkswagen Vento which too is quite spacious and seats three comfortably. It also boasts pretty good ride quality. The Rapid, which is built on Vento’s platform, is as spacious as the Vento and can seat three passengers comfortably. The ride quality of Rapid is better than the Vento. NVH (noise vibration and harshness) is well controlled in the Rapid than in the Vento. Fluidic Verna too is a good bet; except that its seats are a bit low slung and under-thigh support is not as good as the Rapid or Vento. Others such as the Honda City is not the best choice its lighter-sporty chassis does make the ride a little bumpy. City also looses out because it lacks climate control and rear AC vents. Fiesta is also not a good choice because its prominent transmission tunnel and narrow waistline make it suitable only for 2 people in the back. It also lacks rear AC vents though it has climate control. This, of course, is a bit subjective. The car that scored highest was Vento followed by Linea (in T-Jet Plus avatar) and Fluidic Verna. The Rapid also looks solid with its straight forward design and premium interiors. The Sunny is though isn’t considered a very good looking car especially because of disproportionate wheel arches and bulky trunk area. Further, the Sunny also lacks the precise fit and finish offered by its European and Korean rivals. Linea scores because of its very Italian curves and leather upholstery inside while the Fluidic Verna no doubt is a good looking car with top-notch finish. Conclusion: Our top picks for the best chauffeur driven car under Rs.10 lakh are the Fiat Linea, Skoda Rapid and the Hyundai Fluidic Verna.